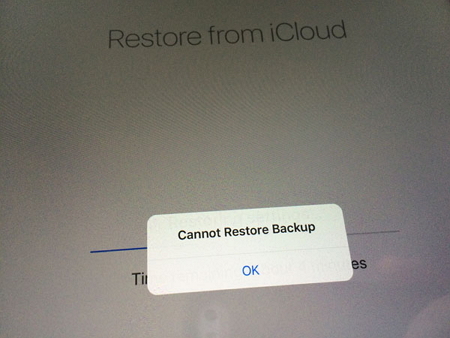 "I am trying to restore an iCloud backup and each time I get an error message saying, 'Cannot Restore Backup'. Is anyone else experiencing this problem and is there any way to bypass it. My iPhone is running iOS 12 now." It is usually more common to restore with iTunes than with iCloud. However, errors are nothing new when attempting to restore your device from a previous iCloud backup. The causes are various. It can be a corrupt backup, incompatible iOS, or maybe the Apple servers are just busy. Either way, we have a few solutions that may come in handy when iCloud cannot restore backup to your new iPhone including iPhone 7, iPhone 8 and iPhone X. We will also share with you an easier way to restore an iCloud backup that won't come with such error message or prompt. Note: If you cannot restore from iCloud backup because it is very slow and it seems it's taking forever, you can find solutions here. 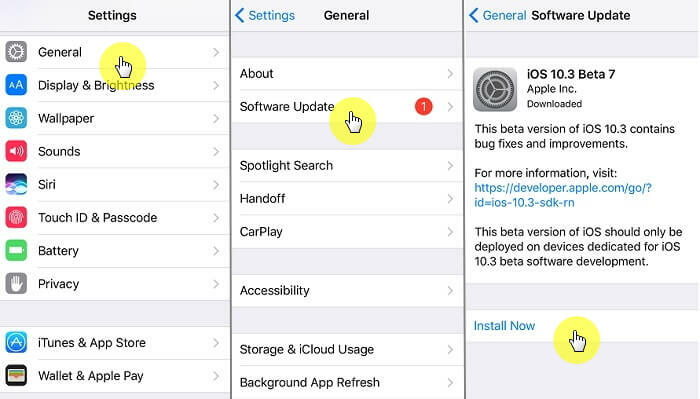 Before you can do anything else, check if your iPhone's iOS has been updated? If not take a moment to do that right now. You may find that after updating to a new iOS version like iOS 12/11.4/11.3, your device no longer experiences errors such as iCloud cannot restore backup. Follow these simple steps to update your iPhone. Step 1. Connect the iPhone to a Wi-Fi network and a power source. Step 2. Tap Settings > General > Software Update. Step 3. Tap "Install Now" Enter your passcode when asked. If you are having issues with restoring iPhone from iCloud backup, you can try using iTunes. Simply backup the device to iTunes and then restore it from the latest backup. You will need to connect your device to the computer. Once it is detected by iTunes, you can click the iPhone icon and you will see the screen below. Now you can click " Back Up Now" to make an iTunes backup. If you have backed up your device to iTunes before, you can just click "Restore Backup..." and follow the on-screen prompts to finish the process. Note: If you are not able to restore iPhone (including iPhone 8 and iPhone X) using iTunes, you can refer to the solutions provided here. You need a functioning Wi-Fi network to restore your iPhone via iCloud. Therefore, the first thing you should check is the network connection. You can try connecting to another Wi-Fi network before restoring the iCloud backup to your iPhone again. Make sure the network is active then it is more possible to restore your iPhone successfully. Hope this will bypass iCloud "Cannot Restore Backup" error. 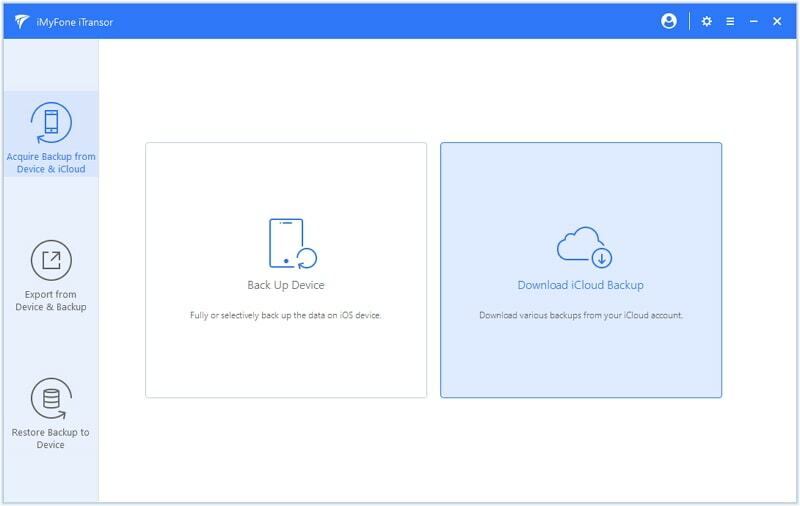 If you are still having the problem restoring your iPhone, you can try a backup and restore tool like iMyFone iTransor (renamed from D-Port Pro) that will allow you to efficiently restore your iCloud backup to your device. The best part of this tool is that you are allowed to restore selectively from your iCloud backup. Also, it does more than just restoring data. It is also useful when backing up data. Some of its most useful features are includes as follows. Almost all of the iOS devices like iPhone 7, iPhone 8, iPhone X , iPad, iPod touch are supported. It allows you to restore only Messages, Contacts, WhatsApp or WeChat data from iCloud backup instead of all the data. You can also restore iTunes/iMyFone backup selectively without affecting all the other data on the device. It allows you to backup only Messages, Contacts, WhatsApp or WeChat data on your iPhone totally for free. It allows users to export nearly 20 different types of data from your iPhone or iTunes/iCloud backup. 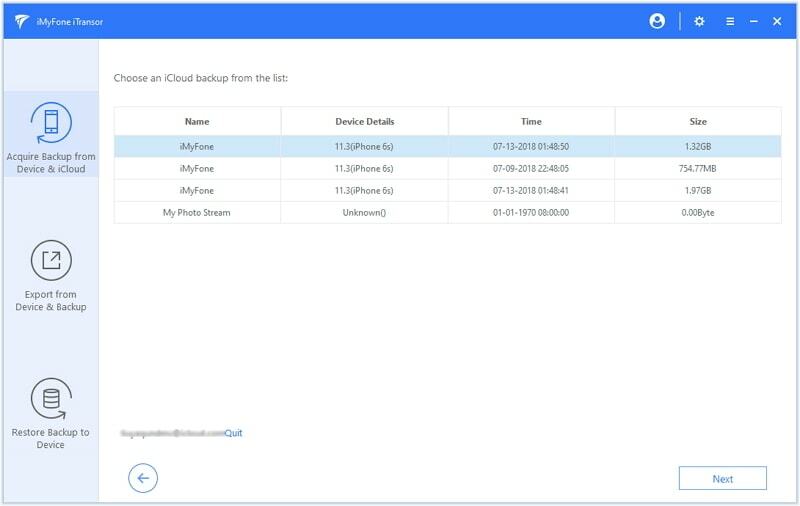 The following is a simple step by step tutorial to help you use iTransor to restore an iCloud Backup to your device. Begin by downloading the program to your computer and then follow these simple steps to do it. Step 1 Download and install the program to your computer and then launch the program. 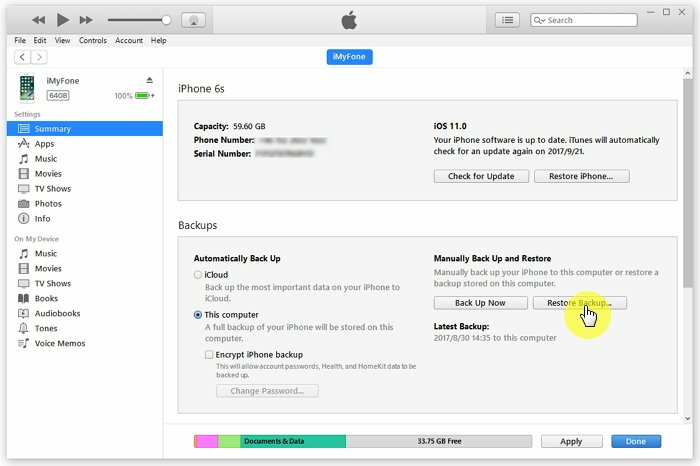 Launch the program and the choose "Download iCloud Backup" from the "Acquire Backup from Device & iCloud" tab. 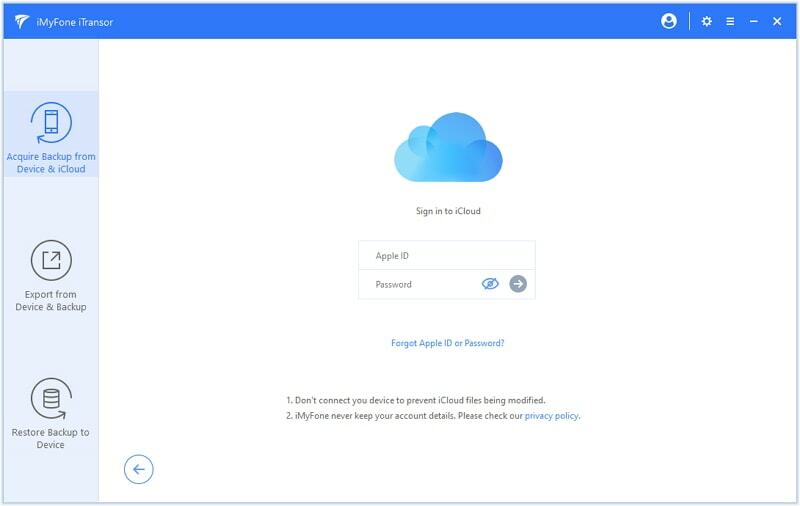 Step 2 Log in to iCloud account to see the iCloud backups in your iCloud account. Step 3 Select the iCloud backup you'd like to download and then click "Next" to download it. Step 4 Once the downloading finishes, choose "Retsore Data from the Backup". 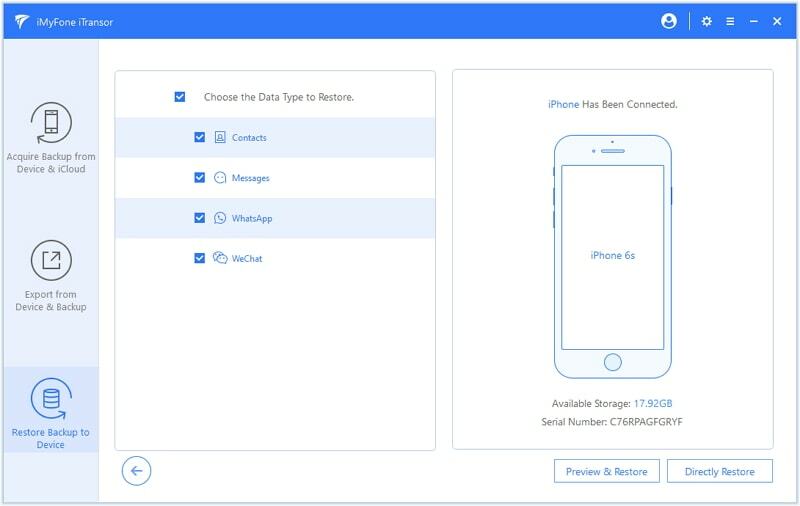 Step 5 Now you can choose the data types in this backup you want to restore like messages, contacts, WhatsApp and WeChat. If you are sure that this backup contains what you need, you can choose directly restore to save time. Step 6 Here you can choose Merge or Replace to restore. 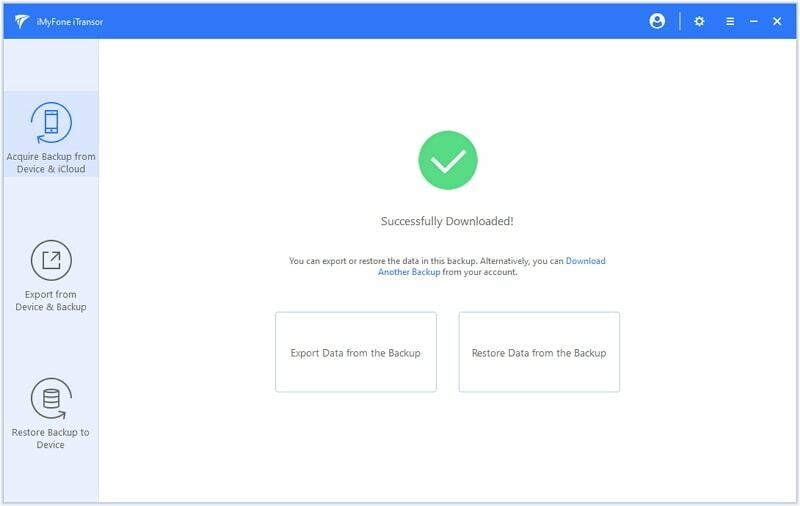 If you are trying to restore this backup to a new device, you can choose replace, because there is no data to worry about being overwritten. 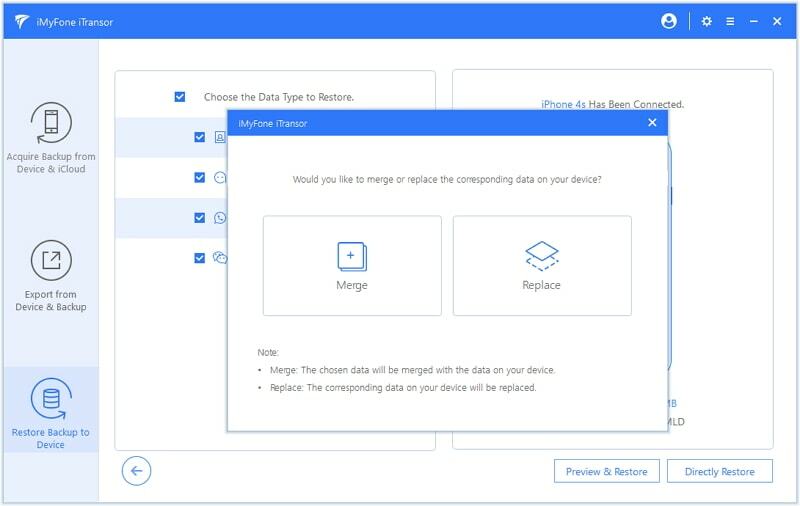 If there are already some data in your device and you do not want them to be overwritten, you can choose to merge. You can view the restored data on your device after the whole process compeletes. Hopefully you now have fixed the problem that iCloud cannot restore backup to your devices like iPhone 7, iPhone 8, iPhone X after reading the above solutions.